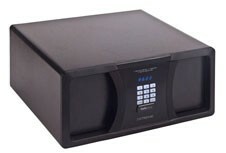 Safeplace Extreme electronic in-room safes feature blue illuminated buttons for easy operation in dimly lit guestrooms, as well as LED display, audio visual feedback for each operation, standard left and right opening, sleep mode, internal light, replaceable doors, and an anti-tamper feature. Extreme safe are ADA compliant, and also have a low-battery indicator and external backup, ensuring that it works under all conditions. Their security features include automatic sleep mode after five incorrect codes are entered and a 500-event audit record. 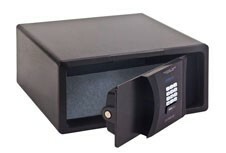 Extreme safe provides an optional power outlet for charging laptops while secured inside the safe, as well as AC power, a feature that is unique to Extreme safes. Available in a choice of black or pale gray, the Extreme line includes a selection of sizes in order to meet the specific needs of a hotel or cruise ship. These include Extreme Compact, Extreme Laptop and Extreme Deep.